Wet and dry - is making it a bit of a grim coaching day for my client. He doesn't have spare wheels so we are having to tread very carefully - so to speak. 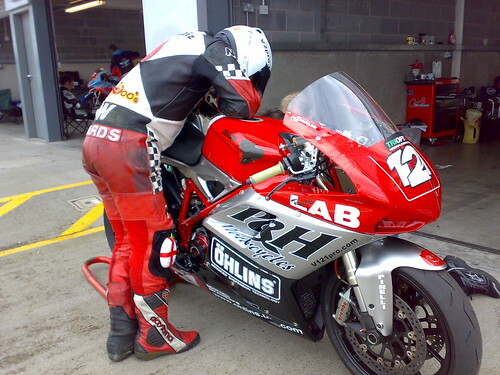 Having a run out on one of Chris Wilson's bikes today. 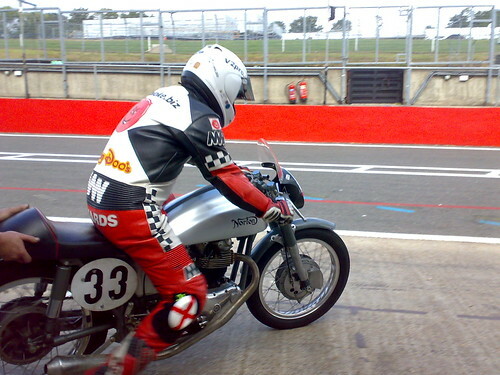 Been invited to ride it at Goodwood. So far today it has been overly warm but no rain. 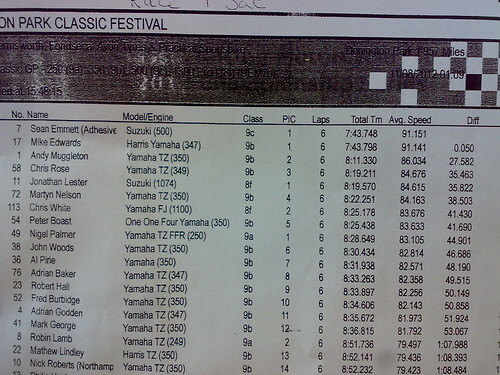 Practice was alright third behind Robbie and Marty Mutt; done a bit of twiddling for qualifying tomorrow. Coaching word seems to be getting round, three folk have called for tips today. 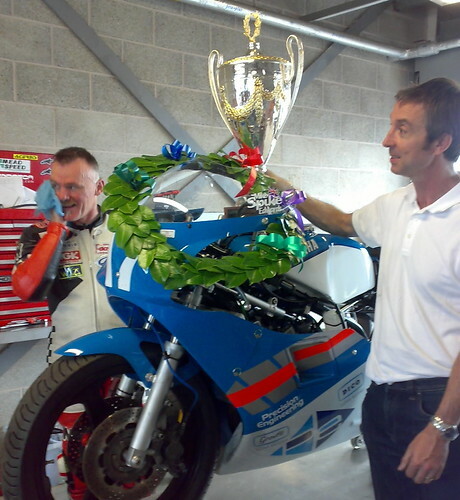 Won the Tom Wheatcroft trophy for Stu to take back home. Got down to a 1.15.246 in the process. Mike Cooper 2nd. Did my best for Stu this morning and managed to get pole with Sean 2nd. 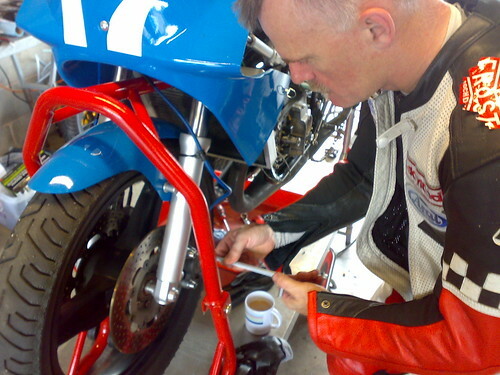 With 53 bikes on track it was hard work getting a clear run. It'll be interesting to see how many end up on the grid as technically we're on the short track. Doing another race before the feature event to see if we can get the suspension set up a bit better. Had a fab time, riding with Andy Muggleton and Dave Grigson. 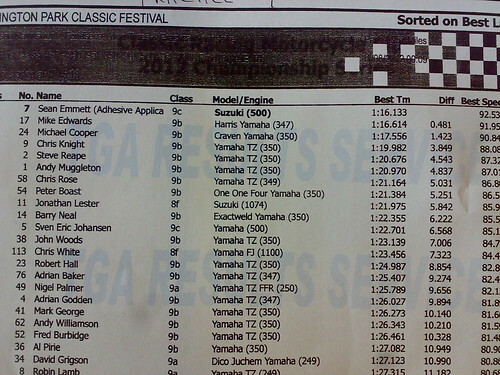 Just finished the day topping the qualifying sheet for the ACU350 with a 1.15.701. Might struggle a bit with this one. Sean himself is not the issue - it's what he's riding! 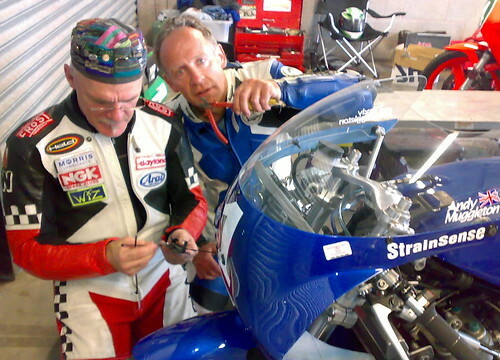 Trying to sort out Andy and his transponder. He wants it as far forward as possible ready for the dash to the line! ... Talking boll@€ks. Here at Donington for some classic racing. Not seen the P&H boys for ages. 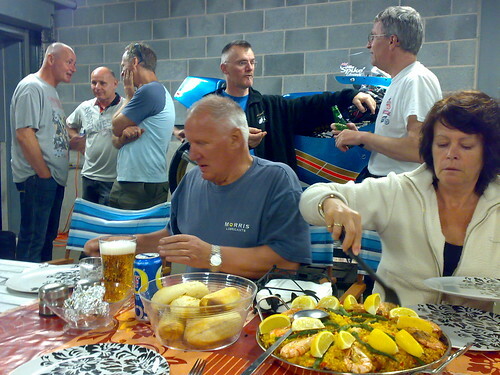 So we thought we would get together and have a run out at Donington. 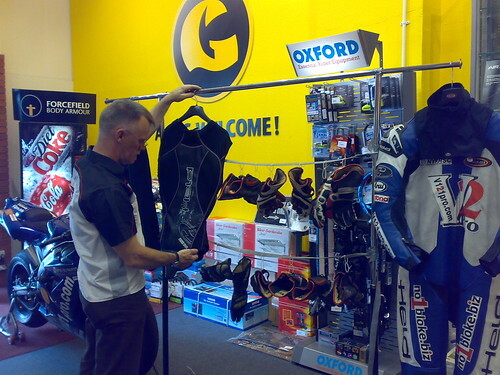 At Get Geared in Leeds who are having a Held promotional day. Brought 'Frank' for a run out and I'm displaying all my Held gear and all their gloves I've worn over the years. I was dreading today's coaching as the weather forecast was lousy. I'm pleased to report so far we are enjoying a warm sunny day.